This state of the art building located steps from Boston’s HarborWalk and the Rose Kennedy Greenway offers breathtaking views as well as an unparalleled luxury living experience. Designed by Howard Elkus to resemble a ship, the Intercontinental Boston is home to 130 residential condominiums with 38 differing floor plans. All residents have access to the hotel’s top-rated Spa and Health Club. The InterContinental’s design and layout is truly astounding. Every appointment within each Residence is state of the art including Rosario custom cabinetry, stainless steel appliances, Sub-Zero refrigerator and Azul Guanabara or Café Granito granite countertops. Baths are fitted with St. Croix limestone tile walls and floors. The on-site SPA InterContinental is an exclusive spa encompassing 6,600 square feet and overlooking the Rose Kennedy Greenway. It is open 24-Hours a day and includes a 45-foot heated indoor lap pool. Massage therapy, cardiovascular training programs, steam rooms, and facial care are specialties of SPA. 24-Hour Concierge operates on premises. 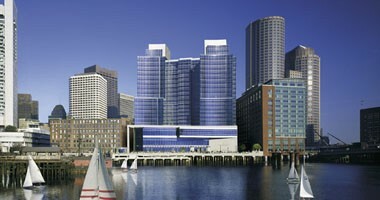 Pet care, valet parking, and room service are also available at the Intercontinental Boston’s Residences.